A new exhibition at Galerie Mitterrand opens on 24 October 2014 featuring a selection of Saint Phalles’ infamous Nanas. 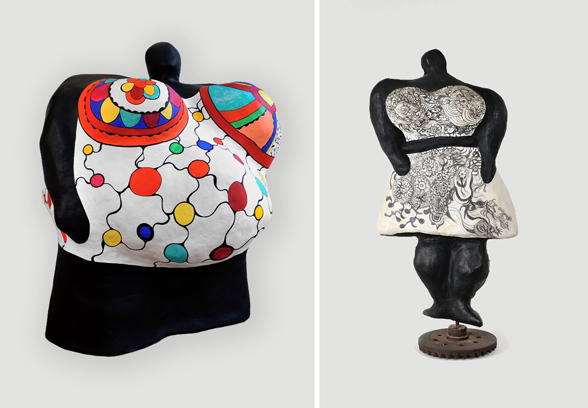 The show titled “Nanas 60s-90s” illustrates an evolution of the Nanas from their beginnings made from chicken wire shapes covered with fabric patches, wool and resin, to a time when technology permitted smooth forms and heightened colors giving them their more commonly recognizable looks. In 1965 Saint Phalle started creating the frolicking, dancing, tumbling sculptures inspired by her pregnant friend Clarice Rivers. With them Saint Phalle captures a feminist spirit: of a “joie de vivre”, of “I am what I am” and directs attention to social questions of women’s liberation and equality. On display until 2 December 2014. For the annual Foire Internationale d’Art Contemporain (FIAC) held in Paris from 23 – 26 October 2014 Galerie Georges-Philippe & Nathalie Vallois showcases a different side of Saint Phalle’s oeuvre. Assemblage (Figure with Dartboard head) (ca. 1962) is an example of combining her early Target Portraits with figurative assemblage elements. It remains unshot in its pristinely white state exposing a gaping heart cavity among jumbled toys suggesting the emotional loss of a lover. With I woke up last night (1994) Saint Phalle created a kinetic painting dealing with themes of vanitas and death. The series of the so-called Tableaux Éclatés (Exploding Paintings) are an homage to her husband and collaborator, Swiss artist Jean Tinguely (1925 – 1991), who created Meta-Relief Dislocation Assurée (1959) early in his career. Both are exhibited at the Galerie GP & N Vallois booth, contrasting and complimenting each other in artistic vision. Niki de Saint Phalle. Assemblage (Figure with Dartboard Head), ca. 1962. I woke up last night, 1994. Jean Tinguely. Dislocation Assurée, 1959 © 2014 NIKI CHARITABLE ART FOUNDATION, All rights reserved. Photo: courtesy Galerie GP & N Vallois. 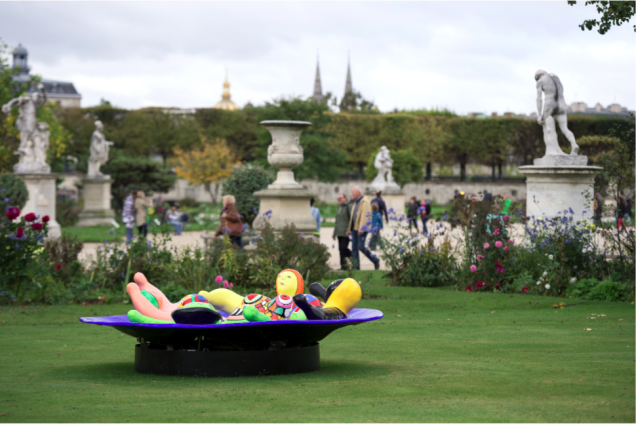 The galerie also exhibits a Fontaine aux Nanas at the Jardin des Tuileries this week. The working fountain depicting four Nanas in a bath scene convey a carefree joy within the royal gardens. Other artists featured for this open air presentation by Galerie GP & N Vallois include César and Pilar Albarracín. 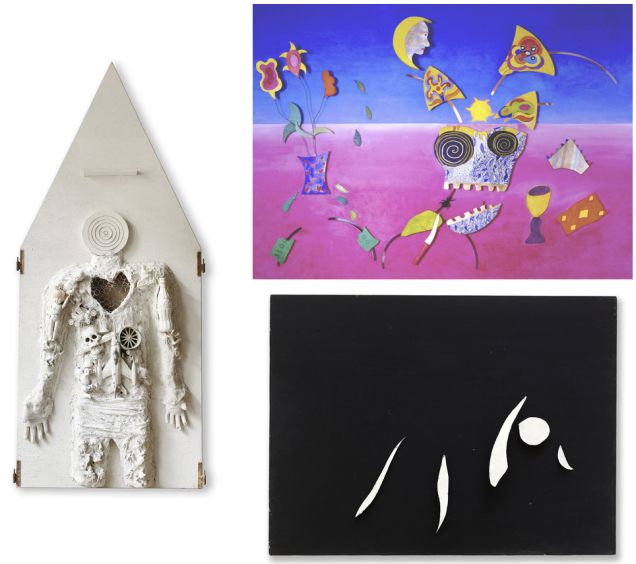 We would like to thank both galleries for their tremendous efforts and passion in promoting Niki de Saint Phalle’s oeuvre to her fans and collectors worldwide.